In the latest edition of our Undergrad Spotlight, we catch up with Nate Yazdani, a senior computer science major who works as an undergraduate research assistant with professor Ras Bodik of UW CSE’s Programming Languages & Software Engineering (PLSE) group. 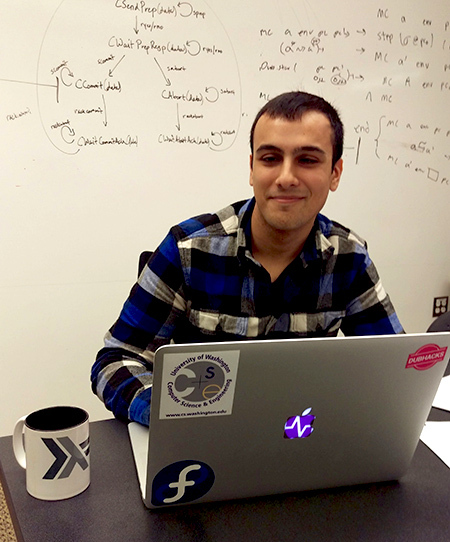 Yazdani, who hails from Battle Ground, Washington, chose to study computer science because of his keen interest in math, logic and programming — a choice he hopes will lead to graduate school and a career in academic research. He appears to be well on his way to realizing his goal: he was named a Washington Research Foundation Fellow for 2016-17, and the Computing Research Association recognized him as part of its 2017 Outstanding Undergraduate Researcher competition. Yazdani takes inspiration from his own time in the lab to encourage his peers to seek out similar opportunities — as one of UW’s Undergraduate Research Leaders, he contributes to classroom presentations and panel discussions that promote the value of research as part of the overall university experience. Yazdani recently accepted a summer research internship at the IMDEA Software Institute in Madrid. Before he could become too distracted by the excitement of planning his next adventure, he shared his thoughts on what makes CSE a special place in which to learn and grow as a student researcher. CSE: What is your favorite thing about being a UW CSE student? NY: This is such a welcoming, close-knit community — CSE actively embraces and supports the diverse backgrounds and experiences of its students. I myself am a first-generation Iranian-American. Following the 1979 Iranian Revolution, my father immigrated to the United States at age 17. Even though he passed away when I was young, his experience has always served as an inspiration for me growing up. Since then, my family has struggled financially, and I am immensely grateful for the scholarships and grants from the university, the department, and outside organizations that have made it possible for me to pursue higher education. I’ve found the students here to be friendly and supportive of each other, and the faculty and staff are always willing to go the extra mile to help me succeed. CSE: In what ways do they help you to succeed? NY: In my research group, PLSE, the faculty and students have gone above and beyond when it comes to encouraging and supporting my research interests. They’ve allowed me to participate in all their group functions, meetings, and seminars and have made themselves resources to help me navigate complex research topics. Whenever I pick an especially hard paper to present in a seminar, the senior Ph.D. students offer to help me understand and present the material. That kind of environment is really conducive to intellectual growth, and I’ve gained a lot from it. CSE: How did you come to work with Ras Bodik? NY: After getting into functional programming, I started reading more about research in programming languages and became interested in doing research myself. The summer before I started at UW, I had the opportunity to attend the ACM International Conference on Functional Programming on a scholarship. The experience solidified my desire to pursue a career in research. Coincidentally, Ras Bodik — whom I had never met at this point — gave the keynote talk at that conference. I connected with him afterwards, and by the time classes started, I was officially working for him as a research assistant! CSE: What do you do in this role? NY: Mostly, I write lots — and lots! — of code. More specifically, I read research papers, design domain-specific programming languages, implement those languages with compilers and interpreters, and design algorithms for program synthesis. I am currently writing a paper that I hope will be published. CSE: What is the potential impact of this work? NY: My research will address one of the challenge problems of the PLSE group’s SandCat project, which is funded by the U.S. Defense Advanced Research Projects Agency (DARPA). In the long term, this work will enable interactive data visualizations to scale to much larger data sets — without losing responsiveness or dropping too much quality. CSE: Describe your favorite moment as a researcher so far. NY: At one point, I was stuck on some particularly difficult problem, so my adviser, Ras, and I worked it out on the whiteboard. We spent four hours on it, in what was scheduled to be only an hour-long meeting. That was a great mentorship experience. My second-favorite moment was going to Houston over the summer for a DARPA principal investigators meeting, where I got to present a research poster about my work on SandCat. That was a pretty cool moment for someone who aspires to make a career out of research. Thanks, Nate, for being an inspiration to aspiring young researchers everywhere—and kudos to Ras and all the members of PLSE for giving our undergrads an opportunity to shine!